Discovery Maps Advertising franchise business opportunity. Free Discovery Maps Advertising business franchise information. Welcome to Discovery Map. Are you ready to travel the road to self-employment, flexible work hours, and the lifestyle you desire? All this and more awaits you with a Discovery Map franchise. Come along on a journey; plan your trip to business ownership and the lifestyle you've been dreaming of. We'll provide the map. What is a Discovery Map? Beautiful to look at and easy to use, Discovery Maps are the perfect place for local advertisers to welcome visitors and get maximum exposure for their advertising dollars. One side of the map features an artist's full-color depiction of the community, with major streets, points of interest, and advertisers highlighted. The other side includes comprehensive listings and display ads aimed at helping visitors find businesses fast. Because Discovery Maps are compact, easily carried in pocket or purse, travelers turn to them over and over again. Many people take the maps home and share them with friends and family. Area newcomers who need to know about local services use Discovery Maps repeatedly. Map publishing is currently a multi-billion dollar industry. Destination maps are not a product looking for a market-the traveling market is looking for maps. In 2002, US residents, alone, spent $462 Billion dollars on travel, spending $166 billion shopping at domestic destinations. Discovery Map is the nation's leading map publishing franchise. Discovery Map's Web Maps are the talk of the Internet! Fully interactive, they promote your community and advertising clients to travelers. Nearly half of all travelers use the Internet for travel planning. Impressively, our franchisees' sites are often listed number one on Google & Yahoo search requests for maps of their territories. 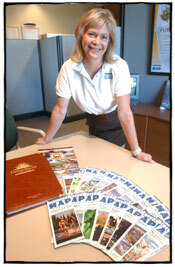 Discovery Guide hotel guest guides and chamber member guides offer other great sources of revenue. At Discovery Map we're always working to provide you with innovative new products and services aimed at driving more dollars to your bottom line. Your job, as a franchisee, will be to sell advertising in your local map and manage its distribution. You will purchase an agreed-upon number of maps from Discovery Map International. Your profit is the difference between your gross sales and the cost of your maps, or guides, and your business operation expenses. Unlike most franchisors, Discovery Map does not collect royalties. Our profits are earned through the sale of maps and production services to our franchisees. You will have virtually no overhead, no design and production staff to manage, and you don't need printing or publishing knowledge to be successful. If you have the personality, we'll teach you the rest. Our experience and strong team will be available to back you up every step of the way. You will never have to travel alone on this adventure! For the lifetime of your business, we offer you unlimited phone coaching whenever you need our expertise and support. We're looking for ambitious self-starters who can sell advertising on a compelling, attractive product. We want entrepreneurs who have been in businesses, or are familiar with how businesses are run. Whether you live or want to live in a small town or a big city, wish to work part-time or full-time, Discovery Map can show you the way. A one-map business in a small town, a cluster of communities, or a large urban center; all present great opportunities to sell placements on the maps and in our Discovery Guide hotel guides. You can run a one-person operation, or embark on our Empire Builder program, which allows you to own multiple territories and manage employees who do the selling for you. The options are as varied and numerous as the destinations. With Discovery Map International as your travel guide you can plan your perfect journey. Why is Discovery Map a great journey and a wonderful destination? Where shall we start? We simply blow away the competition. Our maps are hand-illustrated. They're vivid, beautiful, and fun. Travelers are attracted to them and businesses want to be associated with them. Tourism is a strong economic sector and our franchisees are poised to profit from the need of businesses to attract visitor dollars. When you buy a Discovery Map franchise, we will create a custom, fully illustrated map of your town or city. We maintain strict quality control, insuring that all our maps meet and exceed the highest standards. You will receive a protected territory and benefit from the associative power of the Discovery Map brand. With a low investment and a simple business system, you will be working to live the lifestyle you want instead of living to work. A Discovery Map franchise gives you the ability to take control of your financial future. CURRENTLY WE ARE MARKETING IN THE UNITED STATES ONLY. WE ARE NOT EXPANDING INTERNATIONALLY AT THIS POINT. To learn more about the Discovery Maps Advertising franchise opportunity, simply complete the form below.